Heights Arts welcomes our new marketing intern, Laura Yurko, who will be covering events and special promotions while with us this year. 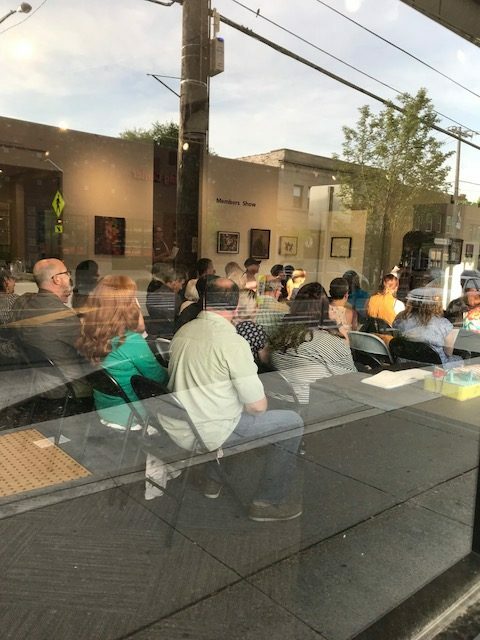 She recently attended the Ekphrastacy in connection with our current Member Show, hosted by the new Cleveland Heights Poet Laureate, Damien McClendon. 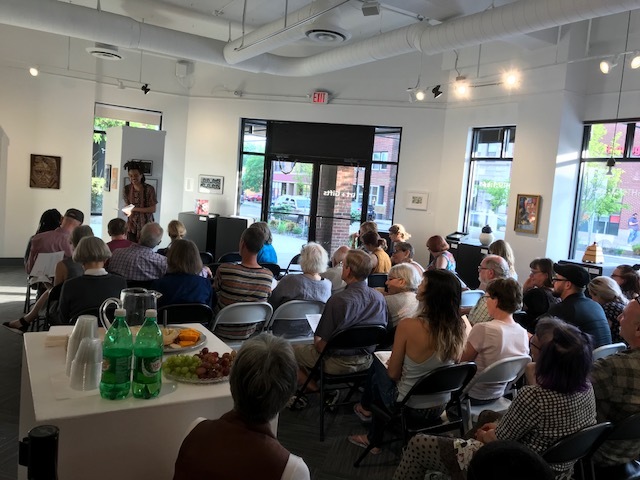 Thursday evening, May 24th, Heights Arts held an Ekphrastacy of firsts! 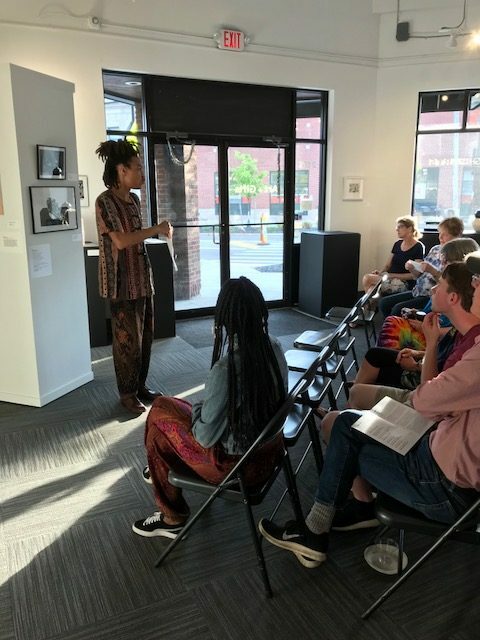 Damien McClendon, as the new poet laureate of Heights Arts, engaged in his first time hosting an Ekphrastacy. 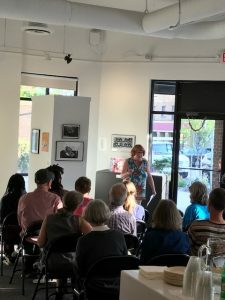 Ekphrastacies, or vivid verbal descriptions of art, are events where the laureate and invited local poets perform their poetry inspired by selected works from the current Heights Arts gallery exhibition. McClendon participated in the previous Ekphrastacy, with the invitation of Christine Howey. 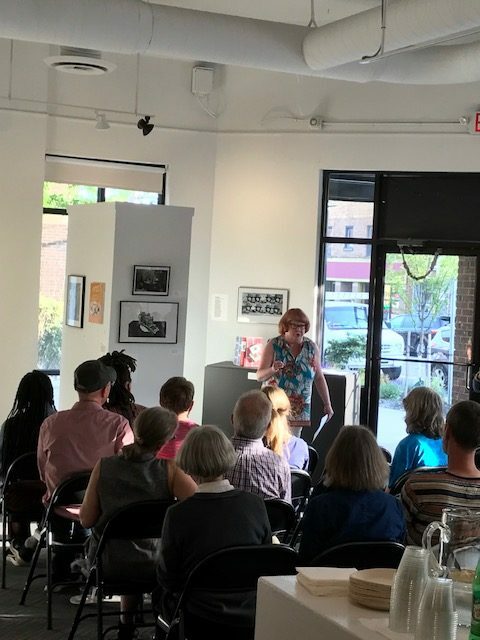 This was also the very first Heights Arts Members Show, exhibiting work from the integral member artists that support Heights Arts. 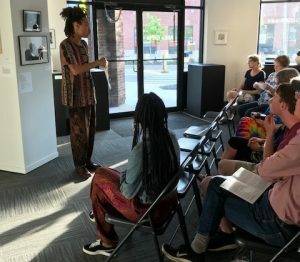 The first 32 pieces submitted by members were curated by Greg Donley and later observed by McClendon and his invited poets, Diane Borsenik, Eris Eady, and Siaara Freeman. The poems were then posted onto the walls next to the corresponding works. 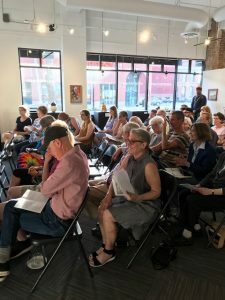 The hybridity and collaboration of the event were mirrored by the alteration of the gallery space. The art pieces and walls were moved to the perimeters of the space, nesting the rows of chairs at the center. 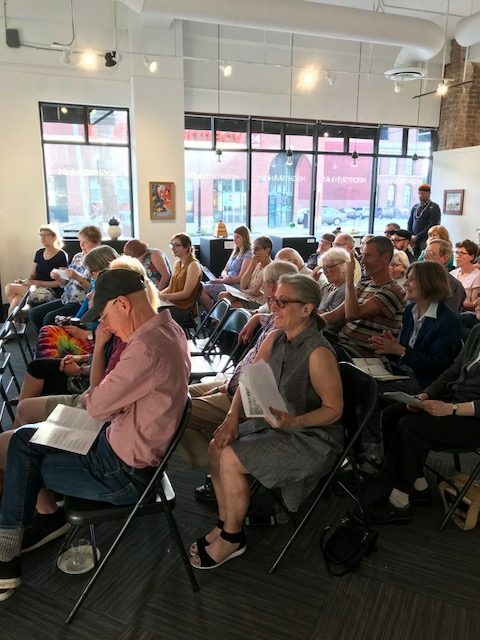 The audience, once present, could see the work referred to in the poems while hearing the inflection and voice of the poet, pairing the two art forms. One by one the visual artists chose to speak of their experiences producing the work. 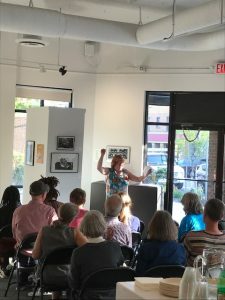 Poets would then stand in front to perform their work aloud. The poets, proud and unique, their voices taking on another layer of presence, delivered their artfully crafted imagery and perspective with passion, warmth, and a touch of humor. The artwork on the walls was often intimate and demur, speaking its message through the side of its mouth. The poems saw this and addressed a similar message, but found a new way of addressing the same topic. Both genres asked the viewer to reflect on these topics in their own ways, back and forth. And when the last poem was recited, McClendon, with a large, welcoming smile, graciously thanked the audience and invited them to further the discussion. These great works of art and poetry will be on display in the Heights Arts Gallery through June 10th. An Overview of the Work of Michelangelo Lovelace Sr. Visual artists and poets rally at our Ekphrastacy events!